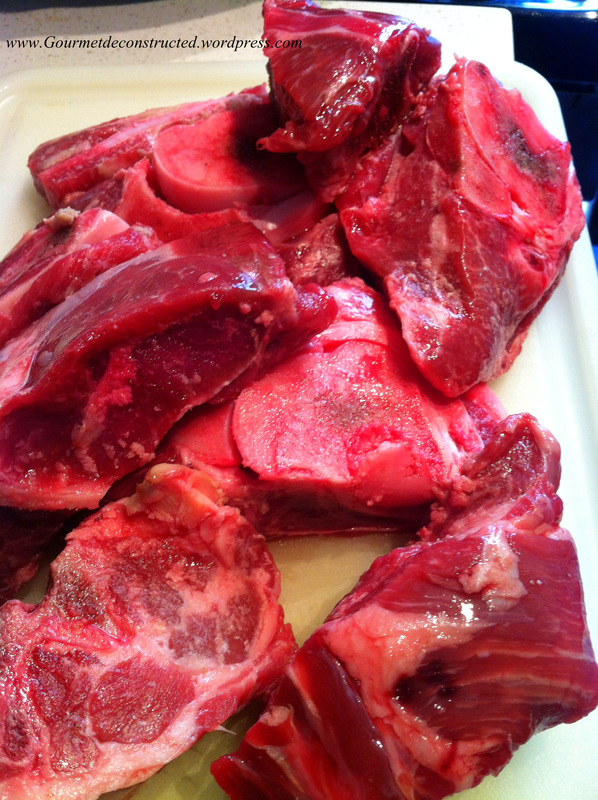 While in the market last week I came across an interesting cut of meat, lamb necks. Now I know every part of the animal is used in the food world, but this was new to me. I decided to challenge myself and cook this part of the lamb, so I grabbed a couple of packages of it. Also it didn’t hurt that this cut of meat was quite inexpensive. This is not uncommon with unusual cuts of meat such as necks, shanks, liver, and tongue; all are usually cheaper. With cheaper prices comes the challenge of cooking these items properly because the meat is usually tougher. The great thing about this meal is that you can turn $10 ingredients into a restaurant quality meal! I decided to cook the neck the same way I would prepare shanks. The dish I decided on had a Middle Eastern flair with spices such as cumin, coriander, and turmeric. Since I’m a fan of the bold flavors from the Middle East. I then paired it with a bright saffron cous cous cooked with golden raisins. The verdict = Thumbs up! You should try this recipe at home and tell me: Should I pay for this in a restaurant or cook it myself? Bon appetit! First season the lamb necks with the salt & pepper. Heat the oil in a stockpot over medium-high heat. Add the lamb necks and cook, turning, for 5-7 minutes or until brown. Transfer to a plate. Add the onion and garlic to the pan and cook, stirring, for 4-5 minutes or until soft. Add the cumin, ground coriander, cinnamon and turmeric and cook, stirring, for 30 seconds or until aromatic. Return the lamb necks to the pan with the stock and tomato. Bring to a boil. Reduce heat to medium-low and simmer, covered, for 1:30 – 2 hours. Uncover and cook, stirring, for 30 minutes or until the lamb is tender. Transfer the lamb necks to a plate and cover with foil to keep warm. Increase heat to high and bring the stock mixture to a boil. Boil, uncovered, for 10-15 minutes or until the sauce thickens. Skim any fat off the top and discard. Plate the lamb with the cous cous and drizzle with the pan sauce. Serve with Greek style yogurt and garnish with Coriander or parsley leaves. In a medium frying pan (with sides at least 2 in. high) over medium heat, melt butter. Add saffron and cook, stirring, 1 minute. Add onion and salt and cook for 3 minutes. Add the raisins and cook, stirring often, until onions are translucent, about 7-8 minutes. Add chicken stock and 1 cup water and bring to a boil. Add couscous, stir, cover, and remove from heat. Let stand 5 minutes. Fluff couscous with a fork, then gently stir. Garnish with parsley or coriander leaves and serve. 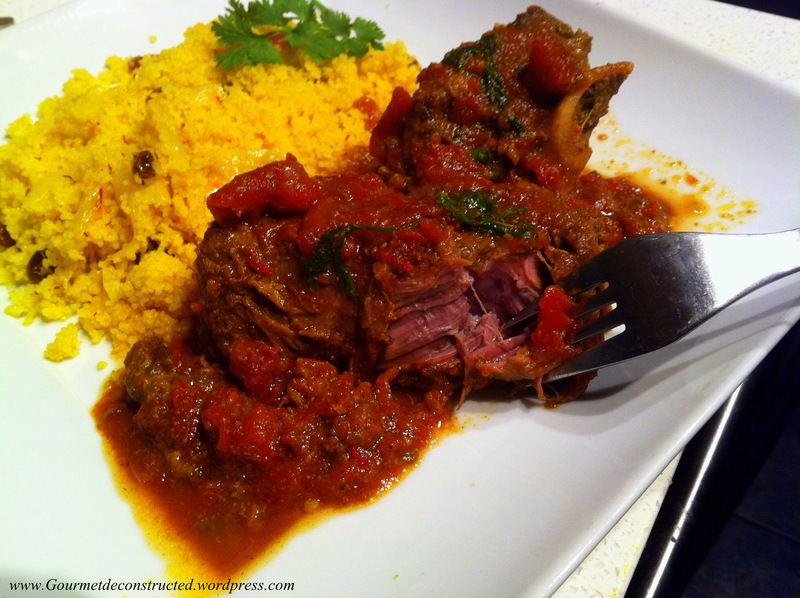 Posted on July 13, 2012, in Lamb and tagged braised lamb, lamb necks, middle eastern, saffron cous cous. Bookmark the permalink. 4 Comments. Big flavours, big man! I love cooking the ‘cheap’ cuts over a low heat for a long time. They are always worth the effort. Brilliant natural falvour and they work so well with wines too. This is brilliant! I remember being a poor migrant child from Europe in Australia: Mom used to buy these strange lamb neck chops ’cause they were so cheap and actually made a very palatable braised dish from them! Have not asked the butcher for these for ages – with this fab way of prepping them just have to 🙂 ! Liver and tongue [which i love!] are not always easy to get in Oz; lamb shanks are, but their price has gone thru’ the roof!! Oh, love your couscous also . . . so a complete meal I can already taste on my palate!